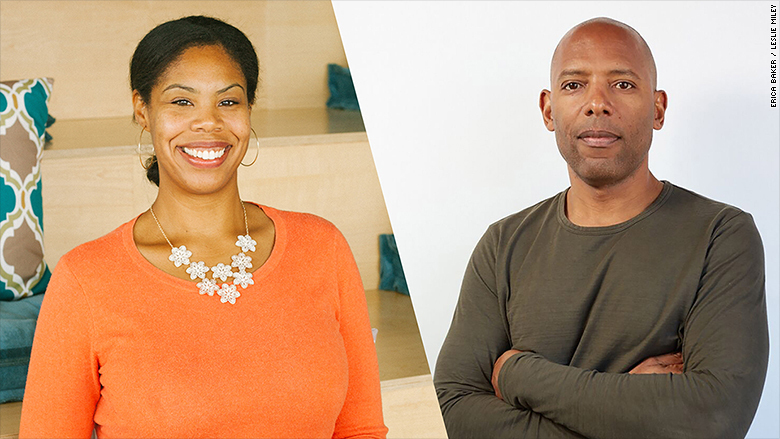 Erica Baker and Leslie Miley have both spoken out about the lack of diversity in Silicon Valley. The lack of diversity is a deep-rooted, painful problem in Silicon Valley. Just last week, Facebook (FB) founder Mark Zuckerberg condemned the behavior of some of his employees for crossing out "black lives matter" on the walls of Facebook's headquarters, replacing it with "all lives matter." That news didn't surprise Erica Baker, a senior engineer at Slack. Baker, who is black, told CNNMoney she was "exactly zero percent shocked." Just 1% of Facebook's tech workers are black. It's only slightly better -- 3% -- in non-technical roles. In 2014, just 2.9% of its new hires were black, according to its latest EEO filing. It's a similar story at other big tech companies. Despite publishing diversity reports and expressing a desire to increase minority hires, they haven't shown a measurable improvement over the last few years. Baker knows what it's like to be one of the few black employees at a big tech firm -- she worked at Google (GOOG) for nine years. Like Facebook, just 1% of Google's tech workers are black. "[Google] didn't seem like a good environment for a woman of color," she said. Baker wrote about her experience in a widely circulated Medium post in November 2014. In it, she details how the isolation and racism -- both overt and subtle -- impacted her physical and mental health. Google did not respond to requests for comment. Since then, others like Leslie Miley and Mark Luckie have also spoken out about their experiences as black men working at Twitter (TWTR). Baker said that while she can only speak from her own experience, coworkers saying things like "you only got hired because of affirmative action" weighed on her. I've heard many similar anecdotes from others in the tech industry while reporting on diversity in Silicon Valley. Black tech employees have recounted being mistaken for a secretary to being told to add a white person to their team if they wanted to raise capital. Baker says tech companies need to take "a deep, introspective look" at the cultures they're creating. "You can't keep shoveling people into a toxic environment and seeing what happens," said Baker, who added that she considered leaving the tech industry all together. Then Slack CEO Stewart Butterfield reached out to her. Baker was at a protest against the Michael Brown verdict. She tweeted out a video to her Twitter followers -- and Butterfield, who didn't personally know Baker, tweeted to her: "Stay safe." "I thought, 'He gets it,'" she said. The fact that he was concerned about a black woman's safety -- especially one who was a stranger -- convinced her that she could work under his leadership. Slack is a two-year-old workplace collaboration software company that's valued at $2.8 billion. Slack, which now has 380 employees, released its first "diversity report" last year. It released a second report in February 2016, sharing that 6.9% of its technical workers in the U.S. are black. "We proactively discuss diversity. We have the hard conversations," said Baker, who has worked there since May 2015. Butterfield made inclusion a very important part of Slack's growth plan. Things like mandatory discussions, lessons on racial injustice and unconscious bias training can help shape a company's culture from the outset. Baker also cited examples like a workshop series at Slack that has brought attention to prejudice in the workplace. Miley, who left Twitter last fall, said companies should get more creative if they truly want to "diversify" their workforce. Why don't more tech companies open up offices in cities where black people make up a bigger portion of the population -- and where well-paying engineering jobs could really make a difference? "Open up an engineering center in Detroit, in St. Louis, Richmond, Atlanta," he said. It's unclear whether what happened at Facebook is ignorance or malice, said Baker. But even prior to hearing the Facebook news, Miley found himself advising entrepreneurs at Black Tech Week not to move to San Francisco. "I really internalized [my] answer which is, 'I can't recommend you coming to a place that is exclusive in its very nature: In where it wants to get talent from, in what it sees as important,'" Miley told CNNMoney. Baker, citing the resurgence of the Ku Klux Klan in the news and Donald Trump's failure to immediately disavow the former KKK leader, said companies need to take measures to show that racism and bigotry won't be tolerated. "We're in a really precarious moment with race relations," she added.